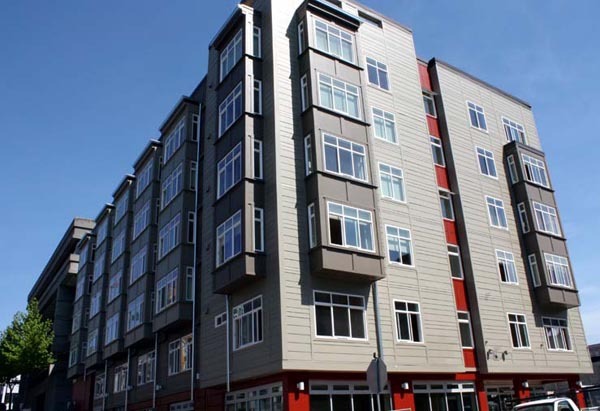 Seattle, WA – June 30, 2009 – (RealEstateRama) – The Grand Opening celebration for The Bart Harvey, in Seattle’s South Lake Union neighborhood, is scheduled for Wednesday July 8. The event will take place at the Bart Harvey Housing site, located at 430 Minor Ave. N. in Seattle, with a brief program from 3:30 PM until 5:00 PM. The project provides housing for low income, disabled and homeless seniors. Formerly called “Cascade Senior Housing” it has been renamed in honor of F. Barton Harvey III, who served as Chief Executive Officer of Enterprise Community Partners from 1993 to 2007, and as Chairman of the Board of Trustees of Enterprise Community Partners and Chairman of the Board of Directors of Enterprise Community Investment until his retirement in March 2008. Mr. Harvey had a career dedicated to the creation of affordable housing and rebuilding communities. LIHI is delighted to have this opportunity to honor Mr. Harvey and his work. Mr. Harvey himself is scheduled to speak at the celebration, as are Seattle Mayor Greg Nickels, Doris W. Koo, the current president and CEO of Enterprise Community Partners, Project Architect Michele Wang and LIHI Executive Director Sharon Lee. Also in attendance will be former Seattle mayor and current Chairman of the Board of Trustees of Enterprise Community Partners Norman Rice. The Bart Harvey is a new construction project which will provide 50 units of affordable housing for low income seniors, ages 62 and up, in the Cascade neighborhood. The 6-story building will feature 5 floors of studio apartments and 1-bedroom units. The ground floor will feature a library room with a computer lab, community meeting space, and offices for case management and support services. The project has been funded through an innovative combination of funds from the HUD 202 program and low income tax credit equity. This approach to funding, which was pioneered by LIHI during the development of the Cabrini First Hill Apartments in 2006, allows the housing to be affordable to extremely low income seniors. Seniors making up to 50% of the Area Median Income are eligible to live at The Bart Harvey. The residents will pay no more than 30% of their income in rent. 10 of the units are set aside for previously homeless seniors. Another 10 units are set aside for disabled seniors. The project’s design was guided by the energy efficiency and green building criteria set forth by Enterprise Green Communities, the first national standard in green, affordable housing. A great many sustainable and health-promoting elements will be incorporated into the design of the building. Some of these design elements – energy efficient Electric and HVAC systems and low-or-no VOC finish materials – have become standard in recent years as the City of Seattle and other public funders have strived to create housing that is environmentally responsible. However, several design features will be used for the first time on an affordable housing project in this region. Notable among these is a green, vegetated rooftop which uses sustainable technology to cover surfaces with lightweight soil, allowing residents to plant everything from vegetable gardens to wildflowers. About LIHI: The Low Income Housing Institute develops, owns and operates housing for the benefit of low-income, homeless and formerly homeless people in Washington State; advocates for just housing policies at the local and national levels; and administers a range of supportive service programs to assist those we serve in maintaining stable housing and increasing their self-sufficiency. Founded in 1991, LIHI has grown to be one of the most productive affordable housing developers in the Northwest. LIHI owns and/or manages over 1,600 housing units at 48 sites in six counties throughout the Puget Sound region. Seventy-five percent of LIHI housing is reserved for households earning less than 30 percent of the area median household income. About Enterprise: Enterprise is a leading provider of the development capital and expertise it takes to create decent, affordable homes and rebuild communities. For more than 25 years, Enterprise has introduced neighborhood solutions through public-private partnerships with financial institutions, governments, community organizations and others that share our vision. Enterprise has raised and invested more than $10 billion in equity, grants and loans to help build or preserve more than a quarter million affordable rental and for-sale homes to create vital communities. Enterprise is currently investing in communities at a rate of $1 billion a year. Visit www.enterprisecommunity.org and www.enterprisecommunity.com to learn more about Enterprise’s efforts to build communities and opportunity.